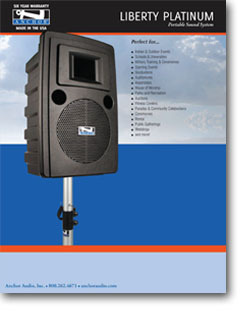 Reach crowds of 1500 with this 28 pound Anchor Audio Liberty Platinum sound system. The Anchor Liberty has a powerful amplifier for 117 db output for up to 6-10 hours on a charge. Available with up to two built-in wireless microphone receivers so there's no need to worry about mic cables. 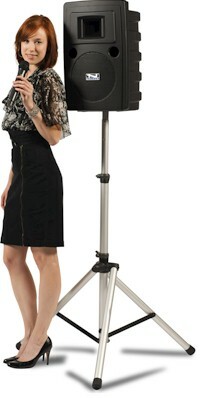 A speaker stand receptacle molded into the bottom allows for easy setup and tear down in less than a minute. 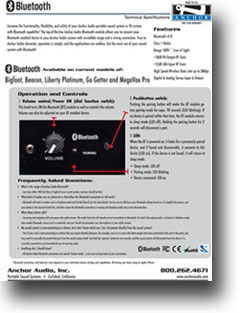 The speaker output powers the optional companion speaker. The Anchor Liberty Platinum Sound System is perfect for sound projection in indoor or outdoor settings and playing music during school activities. The unit delivers 117dB of intelligible speech from one sound system designed for users with no technical knowledge. The Anchor Liberty Platinum is truly versatile with true AC/DC operation and a 110/220 power supply and can run for 6+ hours per charge! The system is ideal for schools, hotels and places of worship or anywhere you need a system - indoors or out! Need to use your Liberty Platinum for two events in the same day? Here's what some of our customers do. Charge the unit overnight so the battery has a full charge. For the morning event simply plug the Liberty Platinum into a wall outlet and you are running off of the AC current. In the afternoon or evening if you need to use the Liberty Platinum outdoors or where power isn't available you still have a full charge on the battery. 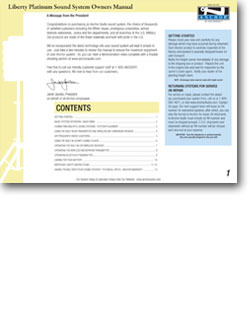 For more on the installed battery see Anchor Battery Info. Handle a crowd of a Thousand! 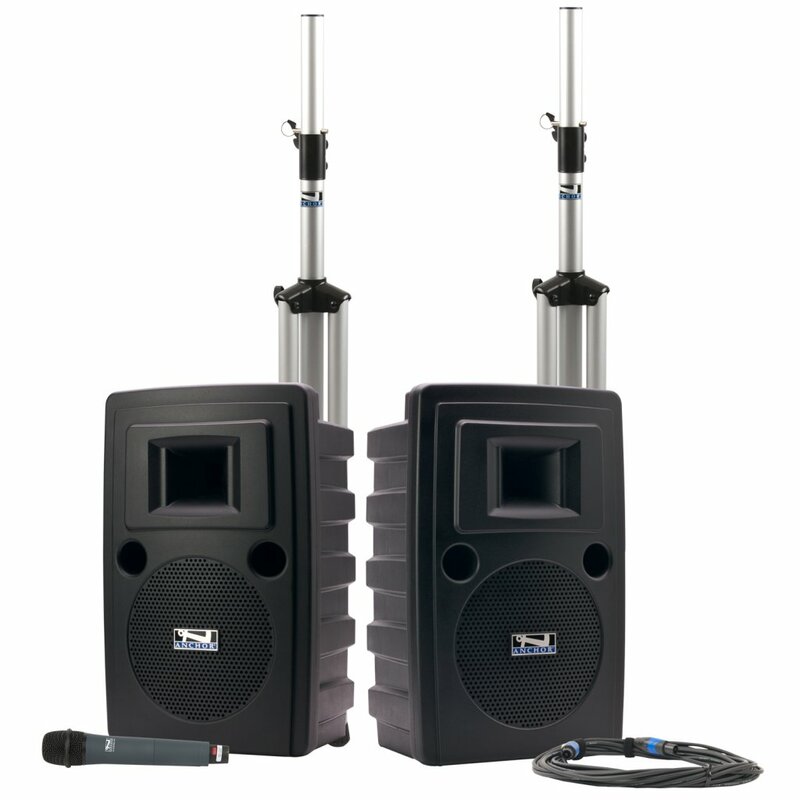 The Liberty Platinum Sound System may have optional installation of one or two Anchor wireless UHF receivers and an MP3 player. Designed for crowds up to 1,500 people with its 117 dB of clear sound. The liberty can handle a crowd of 1000 but not if they are spread out over a vast area such as a football field or larger. The liberty is certainly powerful to handle many demanding situations. 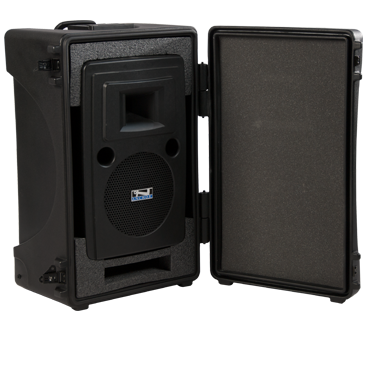 Product HWD: 23" x 14" x 12"
The Anchor Audio Liberty Platinum units sold are brand new units shipped from our warehouse conveniently located in Missouri or directly from Anchor located in Carlsbad California. Orders usually ship the same day or the next business day. If you have any questions please feel free to call our office at 800-960-4287 or e-mail us at sales@ozarksav.com. Purchasing a Deluxe Package gives you two speakers and everything you need to operate your sound system - right out of the box! The Deluxe Package includes the powered speaker with Bluetooth, a CD/MP3 player, and one wireless receiver installed. Also included is a unpowered Companion Speaker an SC-50 cable to connect the two speakers. Two Speaker Stands and your choice of wireless mic. The Companion speaker will get it's power and sound from the main speaker through the SC-50 cable. An AC cord is always included as well. The mic and each input on the unit has a separate volume control. It's like have a built-in mixer! Surprisingly easy to use, softer speaking voices can easily be turned up so they are not overpowered by louder voices. Background music can be played in the background throughout as well. All being easily adjusted on the back of the sound system. The Deluxe Package has the option of a an installed MP3 and CD player. This gives you the option of playing CDs or MP3 files stored on an SD card or USB thumb drive. The CD/MP3player has it's own volume knob so music can be turned down and playing in the background while someone is speaking with a microphone. Playing music at your events has never been easier! The NL-LIB will provide a nylon cover specifically made for the Liberty Platinum sound system. The cover will hold one Liberty Platinum sound system or one companion speaker. 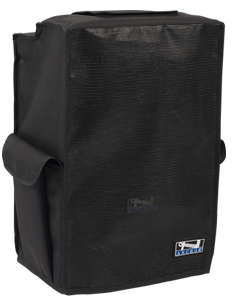 The NL-LIWP will provide a waterproof nylon cover specifically made for the Liberty Platinum sound system. The cover will hold one Liberty Platinum sound system or one companion speaker. 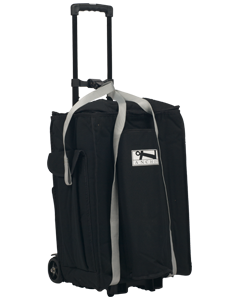 Dimensions: 25" x 16" x 19"
The SOFT-LIB provides a rolling case with an extension handle for the Liberty Platinum. The case will hold one Anchor Audio Liberty Platinum sound system or one companion speaker. The case has a sleeve to hold a stand and a compartment for the mic & accessories. 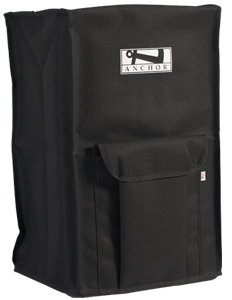 The Anchor Audio HC-ARMOR30 is a hard case for the Liberty Platinum. The case will hold one Liberty Platinum sound system or one companion speaker. 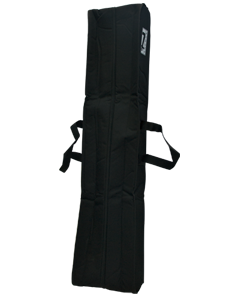 The case has Pick-N-Pluck foam enough space for small accessories.